Posted on July 31, 2018 by Anne Briggs and filed under Furniture Making, How-To. I'm really excited to be working with Marc Spagnuolo, the Wood Whisperer to create in-depth content for his online woodworking guild. If you've been following me or my blog for a while, you may remember an oak writing desk I built with my good friend Jonathan at Homestead Heritage in Waco, Texas. Since I will be modifying and expanding the original design for the desk over the next couple of months and documenting the process for the Guild, I thought I'd share the original article I wrote about the experience building the chest at Homestead Heritage for F&C magazine. Click here to read the whole article. Posted on January 29, 2018 by Anne Briggs and filed under Furniture Making, How-To and tagged Furniture & Cabinetmaking Magazine. 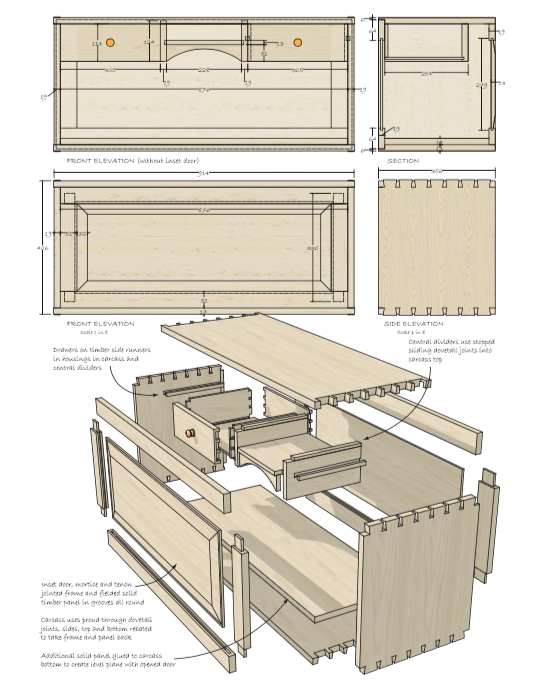 Click here to read my article in Furniture and Cabinetmaking Magazine about a weekend workbench featuring my favorite knockdown joint, the Tusk joint. This was one of my favorite builds to date, because it was a project with one of my favorite instructors at Pratt. Steve brings a whole lot of laughter and knowledge into the shop, and I love designing projects and building with him. Posted on January 17, 2018 by Anne Briggs and filed under Furniture Making, How-To and tagged Furniture & Cabinetmaking Magazine. Building a Windsor-style rocking chair with Greg Pennington at Pennington Windsor Chairs was, to date, my favorite woodworking project. It opened up a new, very physical, very engaging side of woodworking I hadn’t before experienced. I loved using a wedge and sledge hammer to split the tree. Not only did it make me feel strong, it also helped me to better understand how wood works and how to get the most strength possible out of a single piece of wood. Making a chair is, I think for most woodworkers, a major benchmark for progression in their craft. Having seen the Patriot, and being quite comfortable in the realms of square furniture, I really had no intention of ever making a chair. It seemed like it was a whole other skill and toolset than I currently possessed, and I am always wary of casting my net too widely and bringing no genuine knowledge or practiced skill to a craft. As they say, a jack of all trades is a master of none! 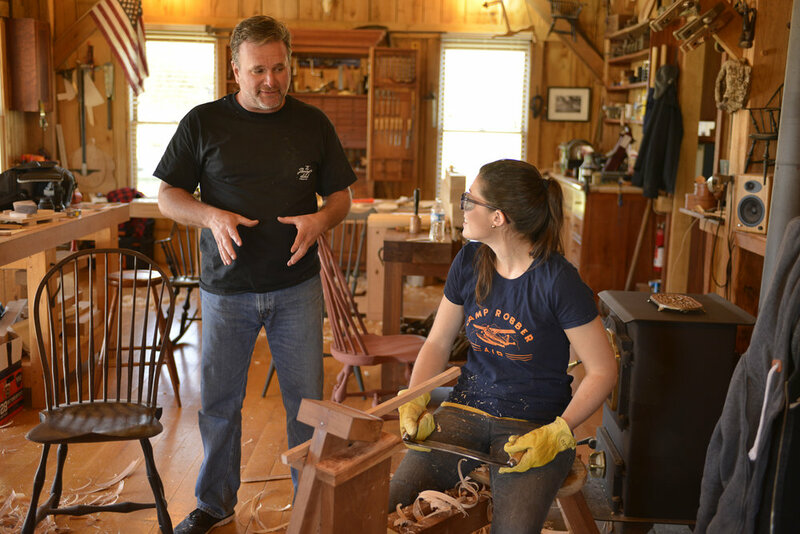 That is- until I was offered the chance to take a class with some of my dearest friends in the shop of renown chairmaking instructor Greg Pennington. For me, woodwork has always been motivated far more by relationship than by finished projects. I’ve found the best way to get to know people deeply is by joining them doing something they truly love. My journey as a woodworker started at my grandfather’s workbench. He was a pretty quiet guy most of the time, but he came alive in his woodworking shop. I loved my grandpa, and spending time with him meant spending time pulling and straightening nails, sweeping sweet cedar shavings off his shop floor, or just watching him work. After my grandfather’s passing, when I was twelve my love for woodworking was re-awakened just a six years ago as a way to spend time hanging out at my sister’s house and getting to know my new brother-in-law as he taught me about using handtools to build furniture. Woodworking then became the connection point for another precious older gentleman, 97 years young, who would go on to become an adopted grandpa of sorts and mentor me further. Then I found the maker community on Instagram, which opened up a whole other world of deep frienships with other folks passionate about making things with their hands. I met leather workers, farmers, musicians and blacksmiths, and my desire to see their eyes light up when talking about something they truly loved led me to start tinkering in those crafts as well. I mention all this because yes, I built a chair, and yes, sitting and rocking in a chair I quite literally found within a tree stump in just a matter of weeks with a few handtools feels pretty awesome, but far more awesome was spending a week learning from a master. 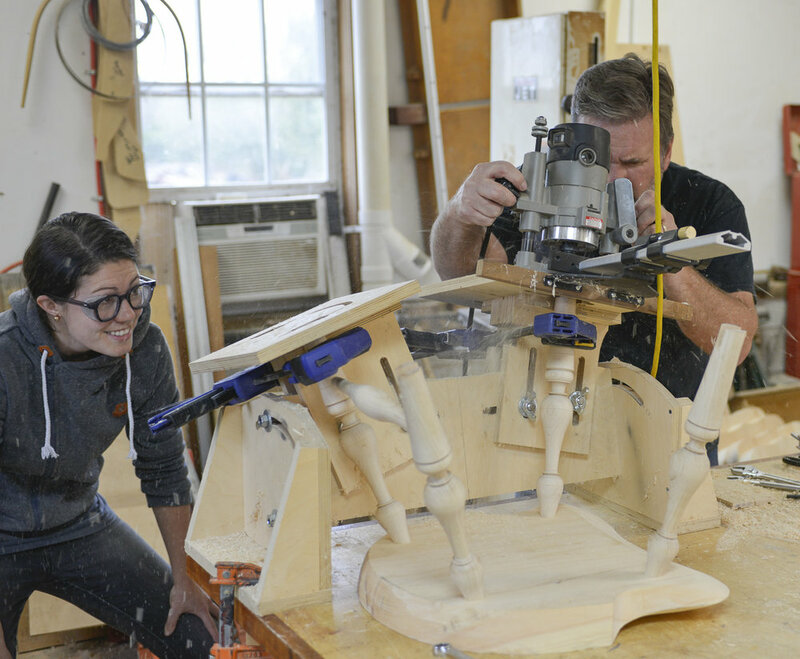 Greg loves what he does, and his eyes sparkle when he talks about every step and technique that bring an heirloom quality chair out of a fallen oak tree. The week I spent in Nashville at Greg’s school was quite literally one of the best weeks of my life. Greg was an incredibly patient and skilled instructor. We worked hard with our hands, we talked about everything under the sun, we drank beer, and we laughed until our ribs were sore. And, at the end of it all, somehow, I’d become a better woodworker with a greater understanding of how wood works, and I got to bring home a chair. This project involved a lot of firsts for me, first time using a shavehorse for it’s intended purpose, which was especially helpful a few weeks later when it came time to build several for the woodworking school I work at. It was my first time riving wood, and I learned about how to predict and correct for grain runout. I learned how to properly use a spokeshave, how to be braver when roughing out stock because it results in so much LESS work later, how to turn square stock into an octagon and then round, and how to drill compound angles with space lasers. I got way more creative with securing round stock in vises designed to hold square stock, I learned how to make and use wedges effectively, and I confirmed that the sanding and finishing process of a chair is just as miserable and loathsome a task with chairmaking as it is with every other woodworking I’ve done in the past. One thing I really liked about chairmaking is how many of the tools can be made with some rudimentary knowledge of blacksmithing. So, of course, as is always the case for me, In completing this project, I somehow added about fifteen others to the “someday” list, so look for those in the coming months and weeks. Check out my new YouTube video on my chairmaking experience by clicking below! Posted on January 13, 2018 by Anne Briggs and filed under Furniture Making, How-To and tagged YouTube. My video on sharpening curved blades is now live on YouTube! If you've got any questions, comments, or suggestions for other videos let me know in the comments below! Posted on January 7, 2018 by Anne Briggs and filed under How-To, Furniture Making and tagged YouTube. Posted on October 23, 2017 by Anne Briggs and filed under How-To, Furniture Making and tagged YouTube. Click here to read my article published in Furniture & Cabinetmaking magazine on block planes- which every woodworker, power or hand tool focused, should have. It is a handy little plane capable of a myriad of tasks. Posted on February 9, 2016 by Anne Briggs and filed under Furniture Making, How-To and tagged Furniture & Cabinetmaking Magazine. Click here to read my article published in Furniture & Cabinetmaking Magazine about striking tools. Get tips on which kinds of mallets and hammers to use where for the best results. Thanks for looking! Posted on February 3, 2016 by Anne Briggs and filed under How-To, Furniture Making and tagged Furniture & Cabinetmaking Magazine. Click here to read my article published in Furniture & Cabinetmaking Magazine about introducing files and rasps into your woodwork to add all sorts of interesting dimension and shaping into your woodwork. Posted on January 30, 2016 by Anne Briggs and filed under Furniture Making, How-To and tagged Furniture & Cabinetmaking Magazine.